One of the most noticeable and dramatic aspects of an effusive volcanic eruption—such as the one happening at Hawaii’s Kilauea—is the hot, molten rock that flows from vents in Earth’s surface. But lava is just one part of the eruption. Volcanoes also emit plumes of gases and particles from active vents. Since plumes can disperse over vast areas, satellites are particularly useful for monitoring them. 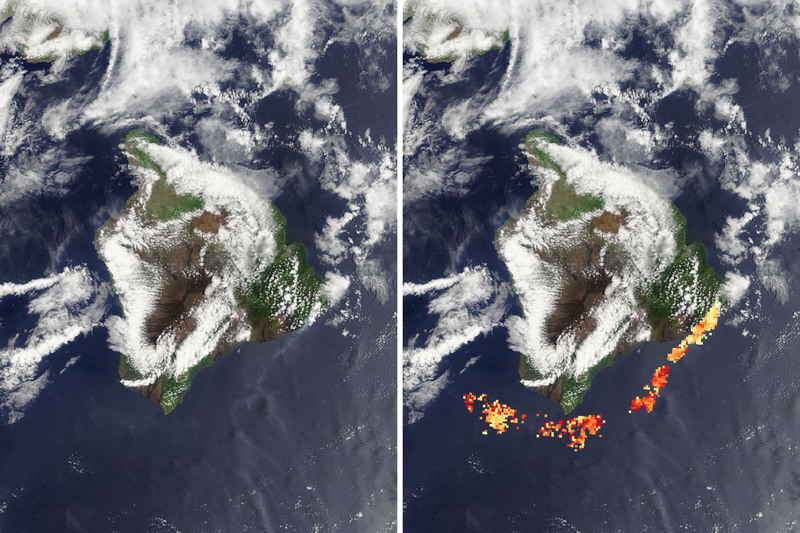 For instance, the Multi-angle Imaging Spectroradiometer (MISR) sensor on NASA’s Terra satellite acquires stereo images that can be used to measure the height of volcanic plumes. It can also make observations of the shape, size, and light-absorbing properties of tiny particles (aerosols) found within plumes. Though Kilauea has been erupting continuously since 1983, the eruption took a dangerous turn on May 3, 2018, when several new fissure eruptions emerged in a residential neighborhood. As the fissures opened up, white plumes of water vapor, carbon dioxide, and sulfur dioxide gas poured out. MISR does not measure these gases directly; it does measure sulfate aerosols, the particles that form as sulfur dioxide reacts with sunlight and substances in the atmosphere to produce a visible haze called vog. 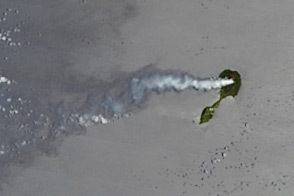 Since both sulfur dioxide and sulfates are heavier than air, sulfur-rich volcanic plumes tend to sink as they disperse. The images above show MISR’s observations of the height of the plume on May 6, 2018. The top map represents the sulfur-rich plume represented in three dimensions as it moved downwind of the active fissures in Leilani Estates. 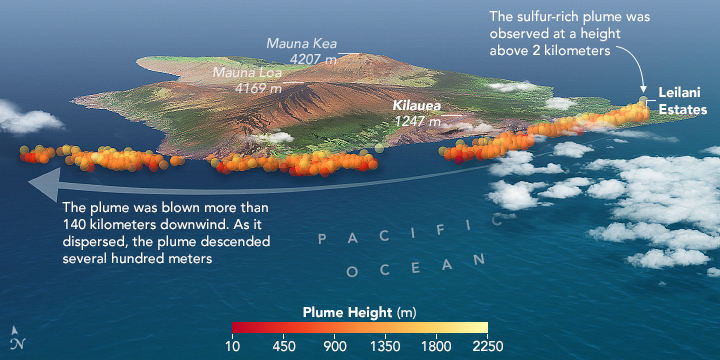 The second image depicts the same data as a cross section, with the height of Mauna Loa and Mauna Kea for comparison. 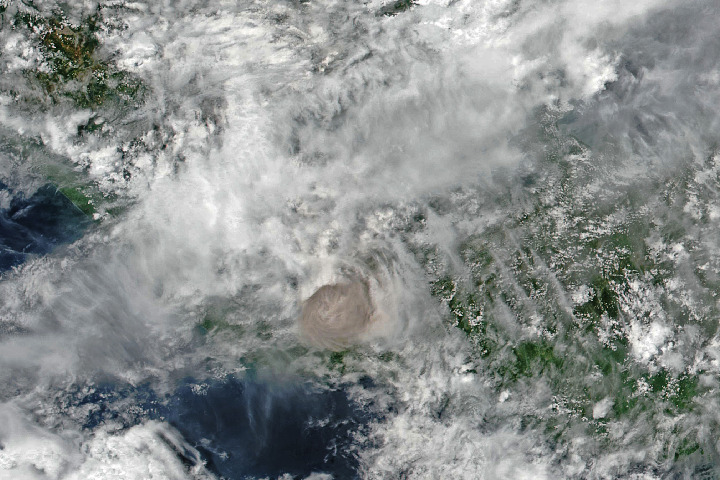 The left half of the image below shows a natural-color view of the faint plume from one of MISR’s nine cameras; the right side shows the height of the plume in shades of red and orange, with the lowest heights in dark red. 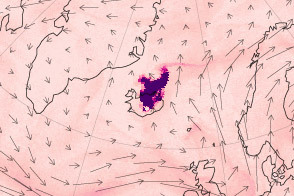 The MISR data indicate that, on May 6, the top of the plume was injected to roughly 1.5 kilometers (1 mile) above sea level, but then descended several hundred meters as it moved 140 kilometers (90 miles) downwind. Winds blew the plume southwest along the coast, but over the ocean, away from people. Low plumes like this are closely watched because they can pose health hazards if harmful gases and particles move toward population centers. If plumes are particularly long-lived or intense, they can also cause damage to ecosystems. “Aside from the height, one of the other things we are able to say about this plume, based on the MISR data, is that the ash content is low. The plume was mainly water vapor and sulfates,” explained Verity Flower, a volcanologist at NASA’s Goddard Space Flight Center. “The particles the satellite detected were small, rounded, and not very light-absorbing.” Particles of ash tend to be larger, more angular, and sometimes darker because they are made up of small fragments of rock, minerals, and volcanic glasses. For a non-explosive eruption like the one at Kilauea, geologists do not expect to see much ash. However, U.S. Geological Survey scientists warned on May 9 that the steady lowering of the lava lake at the summit has raised the potential for explosive eruptions in the coming weeks. If the magma drops below the threshold of the water table, it could absorb more water and produce explosive, steam-driven eruptions that would pulverize more rock in the process and emit more ash. 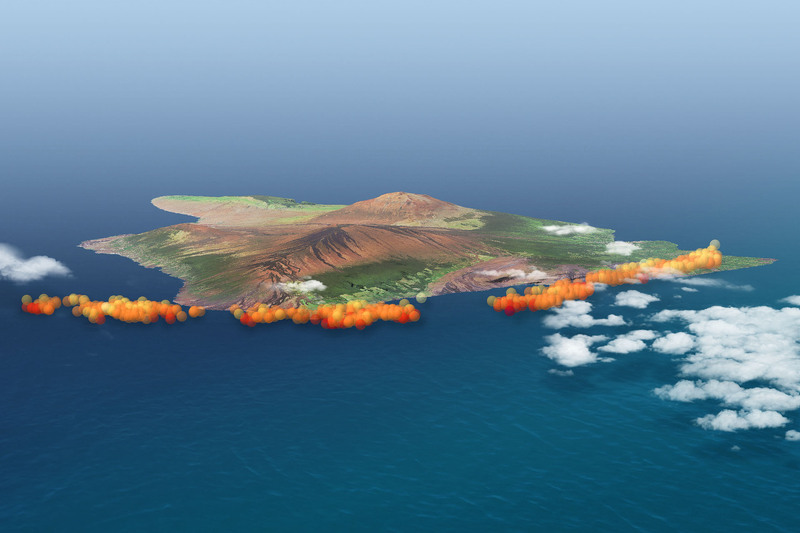 The MISR sensor makes direct passes over the volcano about four times per month. 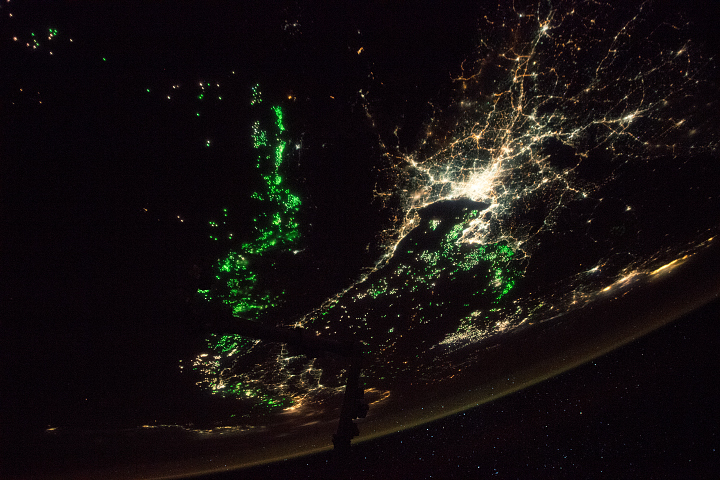 Other satellite-based sensors—including the Ozone Mapping Profiler Suite (OMPS), Moderate Resolution Imaging Spectroradiometer (MODIS), and Visible Infrared Imaging Radiometer Suite (VIIRS)—pass over on a daily basis and make measurements that complement those made by MISR. OMPS, for instance, measures sulfur dioxide directly. 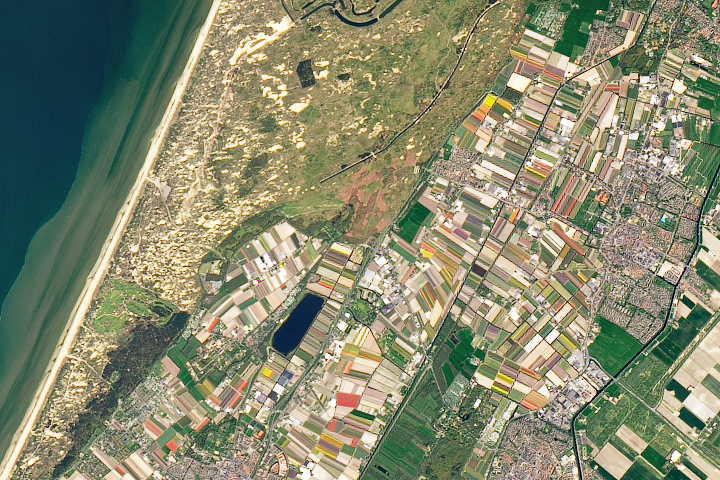 NASA’s Applied Science Program has posted data from several different satellites sensors here. NASA Earth Observatory images by Joshua Stevens, using MISR data courtesy of Ralph Kahn and Verity Flower/NASA GSFC, MODIS data from LANCE/EOSDIS Rapid Response, Landsat data from the U.S. Geological Survey, and topographic data from the Shuttle Radar Topography Mission (SRTM). Story by Adam Voiland. Volcanic plumes can pose health hazards and offer clues about a volcano’s geology. NASA Disasters Program Mount Kilauea Eruption, Hawaii 2018. Accessed May 11, 2018. 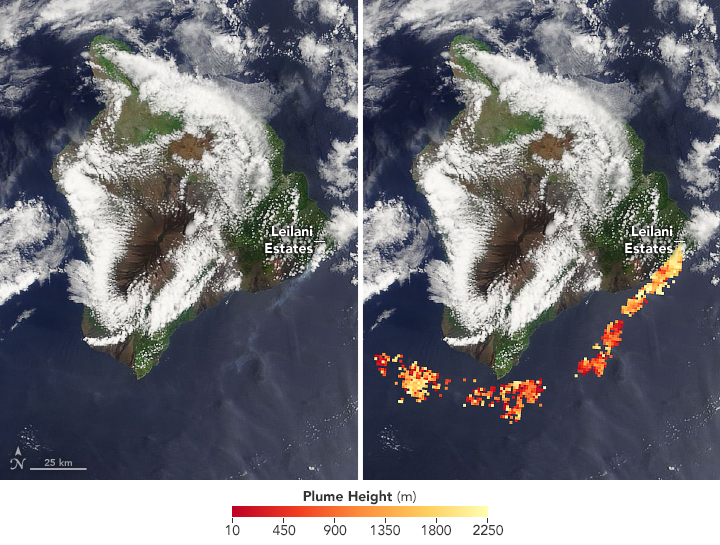 NASA Disasters Program MISR Aerosol Plume Height Measurements from the Kilauea Volcano Eruption. Accessed May 11, 2018. NASA Jet Propulsion Laboratory Ash from Kilauea Eruption Viewed by NASA’s MISR. Accessed May 11, 2018. Hawaii County Civil Defense Lava Flow Information. Accessed May 11, 2018. U.S. Geological Survey Kilauea. Accessed May 11, 2018.